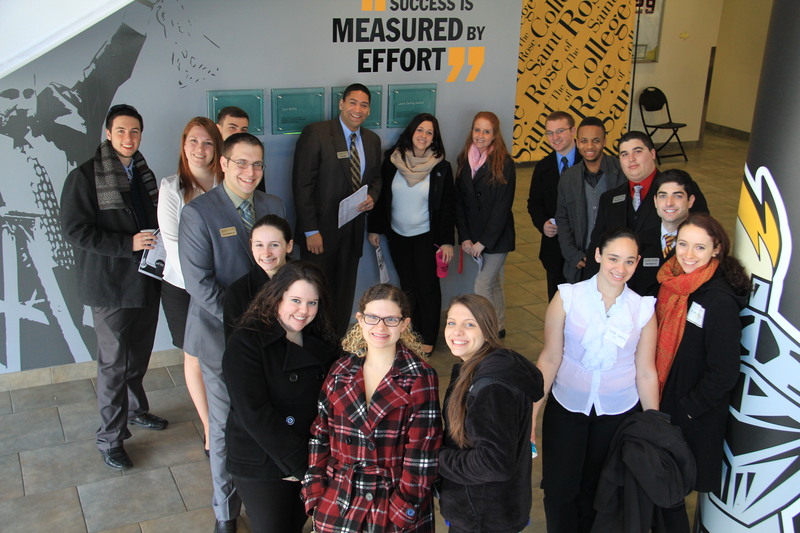 I got to experience two exciting events at The College of Saint Rose this past Saturday, March 23rd. The first part of the day was Accepted Students Day (talked about from a tour guide perspective last year by another blogger), and the second part was Honors Convocation. Accepted Students Day is a day for students who have been admitted to the College for fall 2013 to get acquainted with the people, atmosphere, and services. As representatives of the campus administration, faculty and staff, we were able to personally congratulate and welcome our incoming students, put a face to the name of our offices and services, and share information about how we look forward to supporting them as full-fledged Saint Rose community members. I was able to represent the Career Center with my friend and fellow Career Center graduate assistant Kailah Borchers. We were just two of many office representatives that day, with Academic Support, Residence Life, Study Abroad, Athletics, Graduate Admissions, and Student Clubs being present with us on the 2nd floor of the EAC. As parents and prospective students circled around our tables, we engaged them in conversation about how the Career Center loves to develop relationships with students early on in their college experience to be able to help them develop their career tools and skills over time. After Accepted Students Day, I met my mother and boyfriend in Massry at the Picotte Recital Hall for Honors Convocation. I was so grateful each of them could be there to support me (although I wish I could have invited more people), as they have been supportive all along during my time in graduate school. I saw many familiar faces among the students who were invited to be honored for their academic achievements, contributions to their fields and to our campus. Faculty members from each department entered the stage as The Berkshire Brass Quartet played a processional. Dean of Spiritual Life, Rev. Chris DeGiovine, led an opening prayer, which made me reflect on and again appreciate Saint Rose’s historical traditions (one of the factors that attracted me to Saint Rose in the first place was its spiritual aspects including the presence of the Interfaith Sanctuary). One of my favorite moments of the day was Dr. Shane’s speech, “Live Creatively!“. He stressed that creativity is defined well beyond the common definition of artistic expression, and that a teacher who tries a new approach to educating students in the classroom is living and working creatively. It was also a great pleasure and honor that President Szczerbacki addressed the students, families, and faculty/administrators present. He mentioned that each of us were selected to receive awards because we have lived out the College’s mission as students, which filled me with great pride. As future College Student Services Administrators, my classmates and I often discuss the importance of institutional mission and of living and breathing it as professionals. 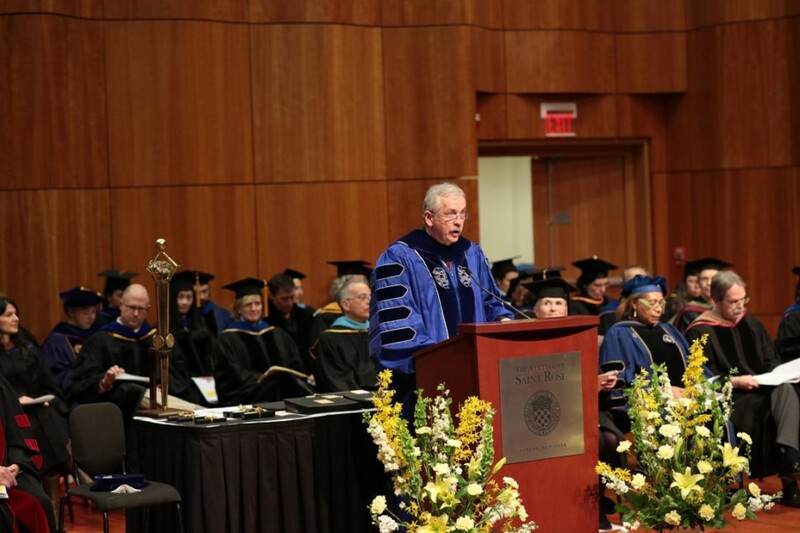 President Szczerbacki encouraged each of us to go out and thank at least one person over the next week who has contributed to our success by supporting us unconditionally. All in all, Saturday brought much reflection on my part. Accepted Students Day got me back in touch with the feelings of being an excited, nervous, and eager new student and how important friendly faces and encouraging conversation are that day. That is a feeling I need to remember as I enter the student affairs profession post-graduation. Honors Convocation allowed me to celebrate the ways I have developed myself as a student with the support of my family and peers, and revel in the appreciation I have for the opportunities I have been afforded by Saint Rose.